Catalyst Question: What's Holding you Back? - iCatalyze - Seeks to catalyze your potential! 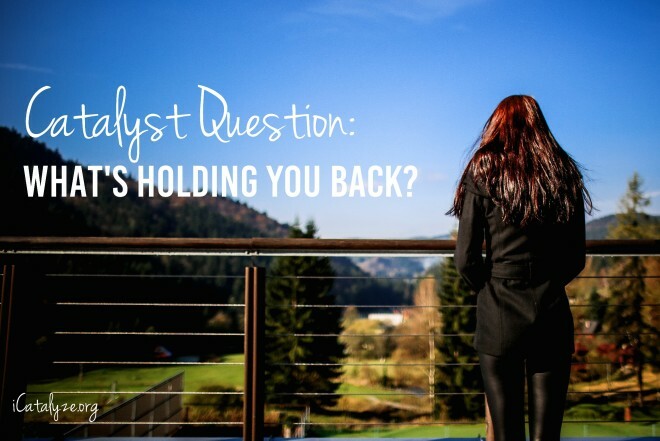 Inicio » Blog » Catalyst Question: What’s Holding you Back? Catalyst Question: What’s Holding you Back? Is there something you want to do, but you’ve been feeling stuck? Maybe you’re not moving forward as fast as you’d like, or you are reluctant to take the next step (or the first step)? This week’s Catalyst Question invites you to revisit your goal and identify: What is holding you back? By pinpointing what is standing in your way, you can decide what actions to take in order to remove the obstacle or find a new approach in order to fulfill your aspirations. First, you need to give yourself some quiet time to think objectively about what is impeding you. Be honest with yourself to identify your reasons for procrastinating, in other words, how are you justifying this or what are you telling yourself about the situation? Stop the “someday” mentality – Sometimes we think very far into the future and have an extended perception of time. We think that our “dreams will come true” in the distant future, and if “it’s meant to be,” it will come to us. Yet, the time is now and we have to put in the work to make things happen. By adjusting your mindset to focus on what you can do in the here and now, and take it one step at a time (see more on this below), you can start progressing toward your goal. Overcome the fear of failure – Failure is necessary for growth and success, and no one is immune. I remember inspiring words I heard from Jean Case, interactive technology pioneer and the co-founder and CEO of the Case Foundation, who said, “If you’re not taking risks, you are not innovating. Fail fast and fail forward.” This urges us to look at failure as a way of learning and building upon new knowledge to get closer to our goals. Plus, by using visualization and imagining how success could look and feel, you can generate positive feelings that can motivate you and serve as a reminder to keep going forward. If we can make this shift in how we look at failure, it can help us overcome that fear. Take back control of your time – We might be telling ourselves we don’t have enough time to get things done, much less start something new. Take inventory on what you do with your time, be honest with yourself. Some apps like Rescue Time help you do this on your computer. Find moments where you are spending time doing things that are “not important and not urgent” which you can swap for activities that will move you closer to your goal. There are countless time management tools out there and you could easily search for a strategy that works for you. The bottom line is to be proactive to get better organized. The first step is to identify what is holding you back, and then you can take steps to move you forward. What else has worked for you? Instant Tweet: Fail fast & fail forward. Failure helps us learn & build upon new knowledge to get closer to our goals. Hi Karen! I’m glad you found iCatalyze and that you are enjoying the content. I hope it will serve as a catalyst for you and look forward to hearing from you again soon!